St John the Evangelist at Shobdon is an extraordinary historic church in 'Strawberry Hill Gothick' style. The church dates to the Saxon period when there was a small timber-framed chapel here. This was replaced in the 12th century by a stone church, built under the patronage of Oliver de Merlemend, steward to Hugh Mortimer. Merlemend had been on a pilgrimage to Santiago de Compostella, and on his return, he founded a short-lived priory here. To this 12th century building, a tower was added in the following century. The current church is the third on the site. It was built by the Bateman family of Shobdon Court in 1756. The Bateman church consisted of a completely new nave attached to the 13th-century tower. It is not certain which architect was responsible for this striking church, but the names William Kent, Sanderson Miller, and Richard Bentley have all been put forward. Shobdon church is a building of astonishing contrasts. The exterior is plain, almost bland, but when you walk into the interior you enter a different world; a world of ebullient rococo and Gothic design that draws its inspiration from the work of Horace Walpole at his London house of Strawberry Hill. This ought not to be too surprising, as the Batemans were close friends with Walpole, and his ideas obviously influenced the design of this extraordinary building. The interior is primarily two-toned, in white with pale blue accents. Highly decorated ornamental arches abound, with exquisite attention to the fine detail of the carving. The centrepiece of the interior is the lavish three-storey pulpit, which is based on one designed by William Kent for York Minster. The church is aisleless, with a gallery above the west entrance, and a chancel marked by a trio of arches that appear almost oriental in style. 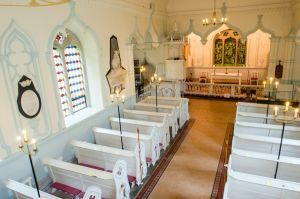 There is a separate door for the Bateman family, which gives onto the family pew, where they were provided with their own fireplace for warmth. There is another door for the Bateman servants, which gives access to the servant's pew in the north transept. There are two fonts; the original Norman font and one built for the 18th-century remodelling. When the 18th-century church was built, the original Romanesque chancel arch was carefully removed and reassembled on the hill overlooking the church. This was linked to two carved doorways with their tympana to create an unusual folly, or eyecatcher. Though somewhat eroded by wind and weather, the arches feature exquisitely detailed Norman carving. The carving was probably done by the same team of craftsmen responsible for the extraordinary church at Kilpeck; the so-called 'Herefordshire School', and Shobdon probably represents their first commission and served as a testbed for ideas that later appeared elsewhere. One tympanum depicts a Christ in Majesty, upheld by angels, the other shows the Harrowing of Hell. Other themes that recur on later Herefordshire School churches appear first at Shobdon, including beaked heads, mythical beasts, warriors wound about with ropes, and contorted dragons. Shobdon is well worth a visit whether your tastes run to Strawberry Gothick or medieval architecture. Location: In the grounds of the Shobdon estate. Well signposted and plenty of parking. Access to the Arches is by a footpath up a sloping hill, across lawns which can be wet after rain.